Last year I decided to replace my pair of old dilapidated concrete/asbestos pre-fab garages with one nice new double garage. I looked into the cost of a brick built garage and got so many ridiculous quotes from greedy builders, that i decided a new sectional concrete garage was the best way to proceed. Not only was a concrete garage significantly cheaper than a brick garage, it was also a lot less mess. Also, as a proper brick built garage would take a few weeks to build, whereas the sectional concrete garage could be erected in a single day! I eventually settled for a concrete garage from Leofric. Leofric have been around for ages, and the sales guy was good and not pushy. Leofric also offered some really nice options like extra wide rear security door to fit my motorbike through, and Horman garage door on the front. All in all, im very pleased with my Leofric concrete garage! The downside of all concrete sectional garages (not just Leofric garages) is condensation. I knew this when i placed my order, but decided that the money saved (compared to the cost of a brick built garage) could be spent on lining and insulating the concrete garage to prevent condensation and make it a nice place to be. 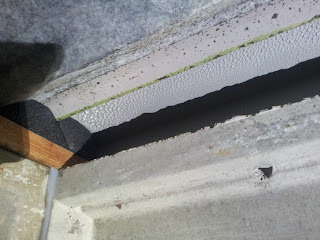 Condensation in garages forms when warm air meets a cold surface. The moisture in the air condensates onto the cold surface, and will eventually drip off onto whatever is below. In the bad old days of sectional concrete garages, this meant that in the winter, the warmer air inside the garage would condensate on the cold metal roof, and eventually drip down onto your car, tools, bikes etc - kind of like its raining inside!! To help tackle the problem of indoor rain, Leofric, and most other pre-fab garage companies now coat the inside of the metal roof with an "Anti Drip" coating. This is basically just a layer of fury material glued to the underside of the roof that traps the condensation and prevents it dripping off. It doesn't prevent condensation, it simply traps the moisture resulting in a cold, wet roof. In fact its not just the metal roofs of concrete garages that suffer from condensation, that walls can also get cold enough to allow condensation to form, and since there is no Anti-Drip coating on the walls, the moisture runs down the walls and forms puddles on the floor below - not great! Many people have tried just sticking loft insulation to the roof and walls of concrete garages and boarding over it. The problem with this approach is that if there is any gap between the cold surface and the insulation, warm air can get trapped, causing even more condensation! you then end up with soggy insulation, and a real soggy mess... Worst still is that many people board over the insulation, so they dont see the condensation.. the problem is hidden, but its not gone away. with time the boarding will get wet, and they will find themselves having to redo everything from scratch. 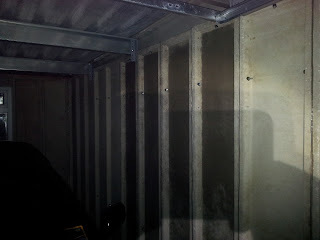 My solution to the problem of condensation on concrete garage roofs and walls is Spray Foam. By spraying expanding polyurethane foam directly onto the inside of the roof and walls, an insulation layer is formed, meaning that there will be no surfaces cold enough for condensation to form! I can then board over the walls and ceiling to hide the uneven foam surface. The only downside of my plan is that spray foam is not cheap, its messy, and I'll have to wait for the weather to be warmer before I can apply it to my garage roof and walls.... hurry up summer!!! Thanks for sharing these tips about garage asbestos roof removal. Removing asbestos is not an easy task to do. I think hiring professional can be a good option for everyone.